Breaded Honey Chicken - No Way That's Healthy! 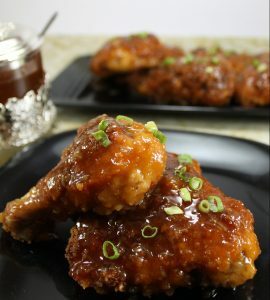 One of my most popular recipes I created for an online magazine was this breaded honey chicken. I think these still fit into the realm of healthy recipes. First off, without the sauce, this makes the best baked “fried chicken.” Super crispy on the outside with juicy chicken on the inside. To take it up a notch add the sauce which makes it sticky and sweet, perfect for Rosh Hashanah or any time of the year! I should also tell you, you may want to double the sauce…it’s that delicious! Want to be notified when new recipes are posted? How about get a FREE Healthy Shabbos E-Cookbook (coming soon!)? Preheat oven to 375F. Line a baking sheet with parchment paper and spray with nonstick cooking spray. Mix the eggs and mayonnaise. Place chicken pieces into this mixture and coat on all sides. In a separate bowl, combine the breadcrumbs with the salt and pepper. Dip each chicken piece into the crumbs, being sure it is fully coated on all sides. Place onto baking sheet and spray the tops liberally with nonstick cooking spray. Bake uncovered for 1 ½ hours. In a saucepan bring the first six ingredients to a low boil. Mix water and cornstarch in a small bowl. Add this to the boiling sauce. Lower heat. Once the sauce thickens, remove from heat. Before serving, dip or coat each piece of chicken in the sauce and garnish with sliced scallions. How long does the sauce take to boil? not long at all! A minute or two. LOL! That’s hilarious. What is a chicken bottom? Thanks.